After climbing 8 miles of mostly dirt road we dip into the Huckleberry Trail which starts at the top of Spruce Knob, the highest point in West Virginia. Nowhere to go but down. We had a light, sporadic rain on the way up but it's stopped now and the trail barely shows moisture except for a touch here and there on some roots and rocks. The wind is calmer now, last night we spent the night on Dolly Sods where it howled all night. Rolled in after midnight, had a few beers and unfurled the sleeping bags. A bright moon rained down on us like an interrogator's lamp; amazing to be almost blinded at night. Larry and I decided not to set up tents so we wouldn't have to break down in the morning. Jody was wiser and probably slept better. When we start across the ridge thoughts of lost sleep are long gone and we pick our way over gnarled roots, reminiscent of aging, arthritic fingers. When the chocolate colored soil isn't exposed it is covered in deep beds of soft pine needles and contrasted by rich green moss. We bob and weave and muscle the bikes through stretches of rocks which appear when the trees fade, only to have them disappear again as we reenter the evergreen tunnels. Clip-CLOP go the big flat rocks that are no longer anchored in the soil. It is a disjointed rhythm as your speed ebbs and flows with small pitches to negotiate followed by spurts of ripping the ridge at speed. The is West Virginia, these patterns repeat for miles and it doesn't get much better than this. A left on Judy Springs trail and we punch out into high meadows on a little used trail that offers views of the next ridge we will tackle once we drop our elevation. Inhale the beautiful scene and then focus on the little ribbon of dirt and rock under your tires, wary of hidden treasures covered by meadow grasses. 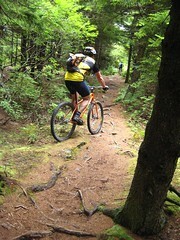 Max the speed and enjoy the ride as we enter into the hardwoods and continue our drop into Seneca Creek. 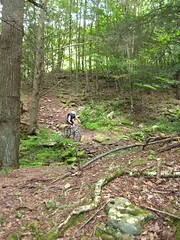 Up the next ridge via Tom Lick, cursing the horses and their riders who have left the trail a muddy, post-holed mess. That's not the way to play nice. Onto Allegheny double track for a short bit, then Leading Ridge and down Elza, full of potential that is not fully realized; the equines have been here again and left their mark. Flush the lactic acid out of the legs on miles of dirt road grinder to get back to camp. The engine warms up and cruises with thoughts of food and beer waiting tent-side. The cadence gets high the closer you think you are, only to see more road stretched out around the next bend. With beers in hand maps get reviewed while dinner cooks on an open fire. Eat hearty, then get set to do it again the next day. A couple of days in Wild, Wonderful West Virginia goes a long way. 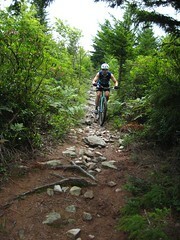 Spent the last 48 hours in West Virginia riding the Spruce Knob area. Beautiful. So many trails, so little time. More later. In the meantime, check out these hot racks. Nice combo of form and function. Speaking of form and function, there's still some SSO cycling caps available, get them here. Saturday's 1903 Adventure Ride started out beautiful and stayed that way. Temperatures topped out in the mid-80s and the humidity was low, a change from the hot, humid weather we've been having. Only a handful of riders opted for my route, others lured by my wife's ride to South Mountain Creamery for ice cream midway. 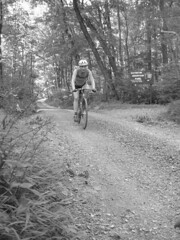 Four of us set out for 54 miles of asphalt and dirt roads with 5700 ft. of climbing on the Catoctin Mountain ridge which took us through some of the most beautiful back roads of Frederick County. Most of the dirt roads we hit have gone through their recent annual regrading and maintenance, leaving lots of loose material to keep you on your toes. High speed descents, especially with tight corners and the inevitable washboard surface that comes with it, mean you need to stay focused and hope your bike handling skills are razor sharp. With the fixed gear, the front brake will only take you so far in these situations. Lock the legs for a split second, two wheel drift, hope your weight distribution is right and those slick 28s don't break loose. 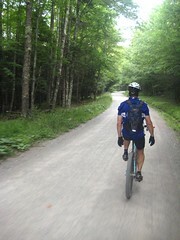 Grind the long uphills, spin high cadence on the flats, the ride had a little bit of everything. Afterward we regrouped with the Ice Cream riders and headed to the brewpub to replenish burned calories. Great way to spend a Saturday. If any locals are interested in doing the route, you can find a cue sheet over here.